Music, dance and beer heralded the grand opening of the Royal Garden Plaza’s Paulanergarten beer garden, which just happened to be on the day traditional German carnival season begins: Nov. 11. 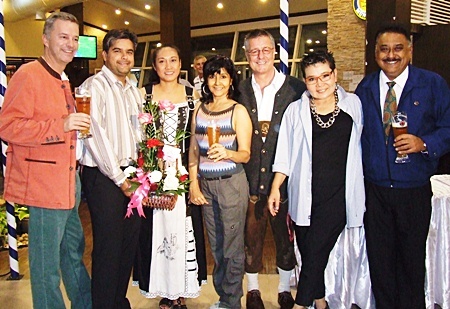 Managed by Irishman Kenneth Whitty and wife Kanpitcha Kongsombat, the Pattaya Paulanergarten is the second location opened by their Danmark Co., Ltd., the exclusive distributor of Paulaner beer since 1999. The other is in Bangkok. 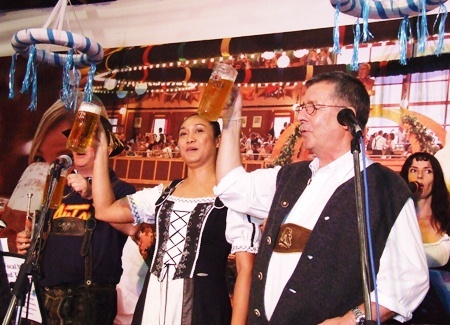 Both are Bavarian style beer gardens serving Paulaner beer. On this special occasion, “Original Oktoberfest beer” was also available from the Hacker-Pschorr brewery, which belongs to the Paulaner group. A lovely Kellnerin serves up ample amounts of Paulaner beer. 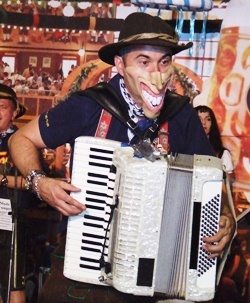 “Smiley” rips through the chords on his accordion. 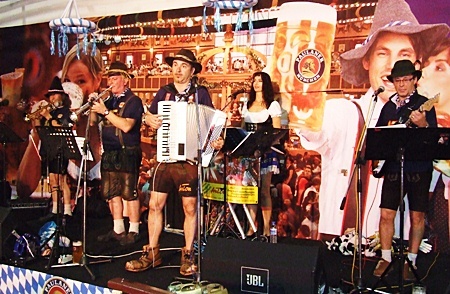 When the Bavarian show band “Anton” took to the stage, it didn’t take long for the festive mood to take hold with an international crowd swaying to the music. 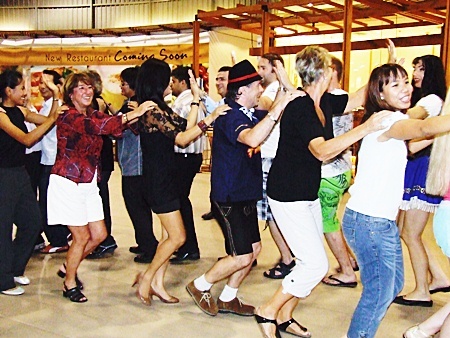 Anton has been playing in Thailand for Oktoberfest, with their tour sponsored by Air Berlin. The highlight of the evening was the traditional polonaise, a slow rhythmic dance that has its roots in Poland, but is regularly performed at German carnivals. Between the music sets organizers staged contests, such as beer-drinking, sausage-eating and singing. Paulaner souvenirs were given as prizes. Paulanergarten is located on the third floor of Royal Garden Plaza and offers both German and Thai dishes and nine types of Paulaner beer (including alcohol free beer). The restaurant two sections, one with air conditioning and a terrace under the sky with a view of Pattaya Bay. Everyone is certainly having a good time. The Bavarian show band “Anton” entertains a packed house. Guests join up for a traditional polonaise dance. Paul Strachan (left), looking better than ever, interviews Kenneth Whitty for Pattaya Mail TV. 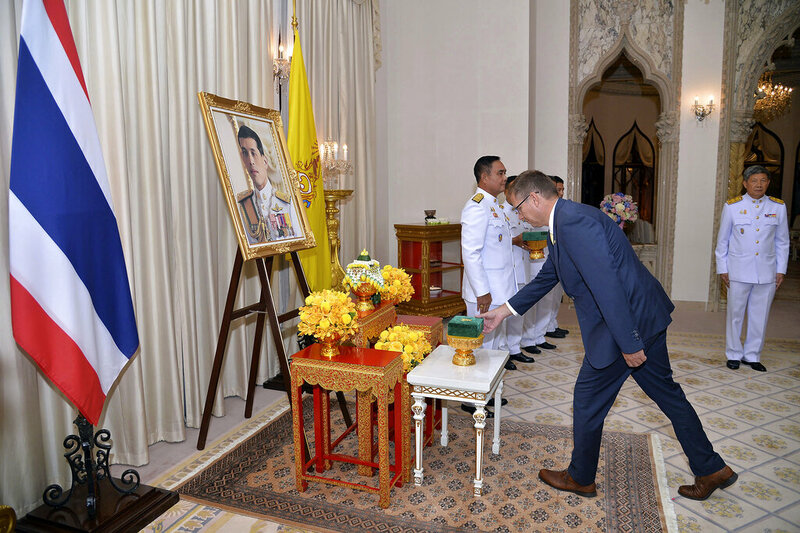 Tony Malhotra (2nd left), sales and marketing manager of Pattaya Mail Media Group, presents a flower bouquet to Kanpitcha Kongsombat (3rd left), executive director of Danmark Co., Ltd., on the grand opening of Paulanergarten. Also on hand were (from left) Ingo Räuber, general manager Pinnacle Resorts, Sue K., director of communication Pattaya Mail TV, Kenneth Whitty, managing director of Danmark Co., Ltd., Earth Saiswang, director PR and communication Oasis Spa, and Peter Malhotra, managing director of Pattaya Mail Media group.